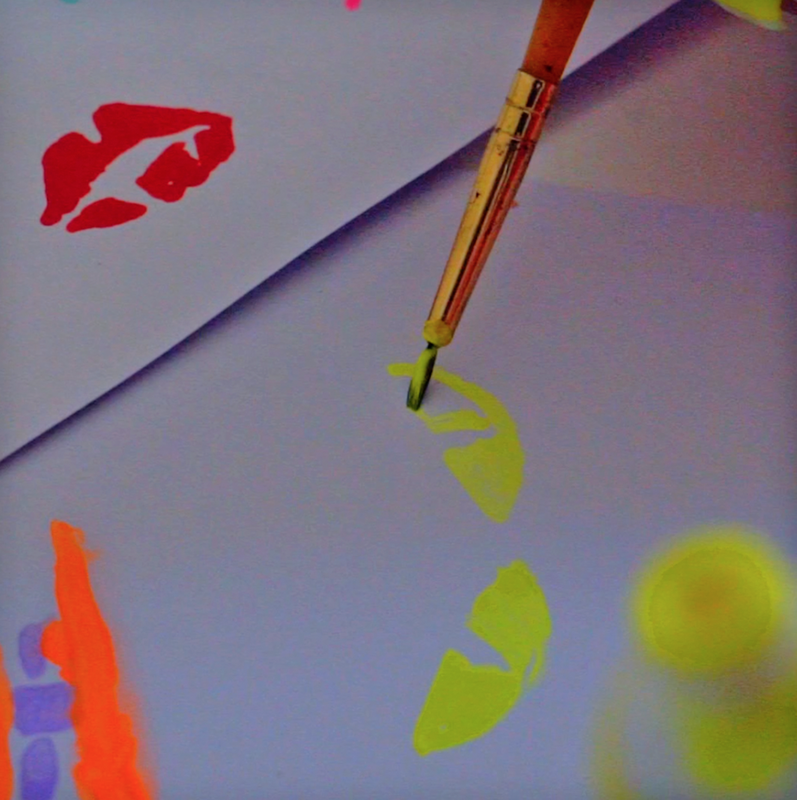 COME MAKE HALLOWEEN NEON WITH ME! You guys have been asking for tutorials FOREVER, so I’m finally getting to it. My goal is to start doing these as vlogs so you can watch and join in at the same time, but until I figure all that out, here’s a video of me pantingly pumpkin, with all the steps & what you need below. A pumpkin - I went for an organic one to do my bit, but any pumpkin works. Try to choose one that’s as smooth and round as possible, that will make decorating it so much easier. Various paint brushes - A wide one for the white paint and finer ones for the detail. White paint - I used a Matt water-based emulsion - this is an inexpensive paint that you’ve probably already got in your DIY cupboard and being water-based any splashes or spills are easy to clean up. If you want to keep it earth friendly too, I used @Earthbornpaints Ecopro Matt emulsion in white. A plinth - You can use anything for this - you just need something to raise your pumpkin so you can get maximum paint coverage and have it at a nice working height. I used a @poppin silicone pencil holder - that way when I moved it round the silicone didn’t scratch off the paint. If you use a jar or something tough like that, try putting a little piece of paper or tissue in-between to protect the painted areas. Coloured Paint - I think most paints will work well on the Matt service of the emulsion, but I used Acryla Gouache paints. Acrylic paints would probably work just as well. Glitter & PVA glue - Any type you like. I went for a chunky gold & regular non toxic PVA. Varnish - Optional. I decided not to varnish mine because I liked the Matt finish and this wasn’t going to go outside so it didn’t need extra protection, but you could totally varnish it if you wanted to seal all that fun in there. Place the pumpkin on your plastic sheet & paint the bottom. Let it dry, then set it on your plinth and get painting the rest of it. Once that first coat has dried, give it a second coat so it’s nice and smooth (don’t worry about giving the bottom a second coat, you won’t see that anyway). ﻿Whilst you’re waiting for the pumpkin to dry completely, draft out your design. I chose the same colour for each design (so for example all the bats were purple) this makes your life a bit easier when it comes to getting a balanced pattern. ﻿Once you’re happy with your design and your pumpkin is nice and dry, get to work. I painted one element at a time, so all of the bats, then all of the eyes etc. This way you can make sure that they’re all spaced out nicely. Aaaand repeat. The advantage of having it on your little plinth means you can rotate it round until you’re happy and you don’t have to keep lifting it. ﻿Add all the black details and finishing touches on last, making sure that they’re well balanced and neat - you can be a bit messy with the colours, but try to be precise with the black, as this is what will stand out the most. Glitter time! Once you design is dry, add a layer of PVA to the stem but be really careful to just get it where you want it to stay. Then mix PVA with glitter for a thick tacky coat again being extra careful not to go on the pumpkin itself. Then when you’re happy it’s all covered, pop the pumpkin on its side on your plinth (or ask someone to hold it on its side so they can rotate it for you) and sprinkle more glitter over the PVA area. Don’t worry if this gets a bit messy, just use a dry brush to get rid of unwanted glitter. (although no glitter is ever unwanted in my opinion). 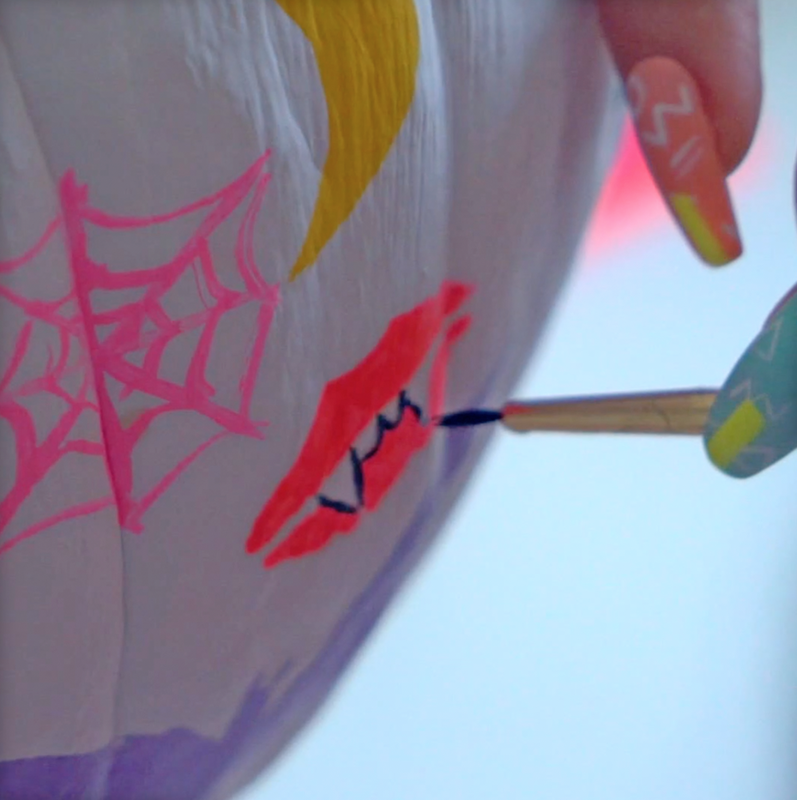 Alternatively you can leave out this step if it’s not for you - you can simply paint the stem another colour, but I think the glitter is what makes this pumpkin pop, so get crafty. Ta daaaaaa. Ok so now you’re ready to show off you’re extra special pumpkin. 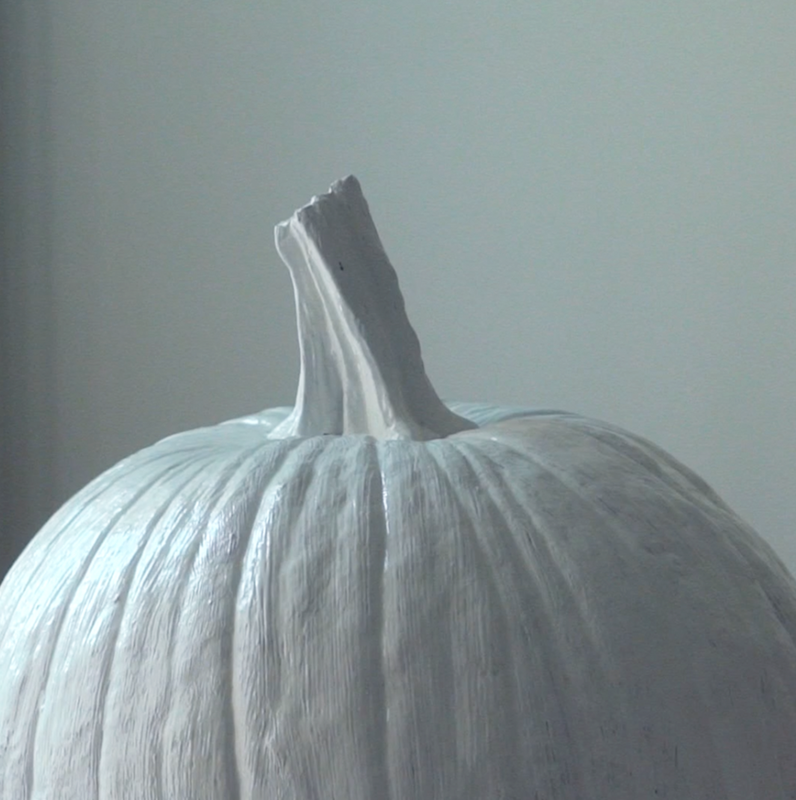 (You can add an optional layer of varnish here, but that’s not necessary if you’re displaying your pumpkin inside). I hope you enjoyed this! if you give this a go, please tag me in your photos so I can see @nikipilkington. And let me know in a comment below or on Instagram if you have any questions, I’m here to help! What tutorial should I do next? Let me know!